You will need guts to challenge your opponents to duels in order to secure and hold the best properties. 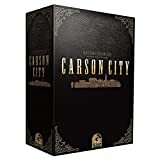 You will also need to recruit and use the help of the most interesting "personalities" in CarsonCity to aid your cause. 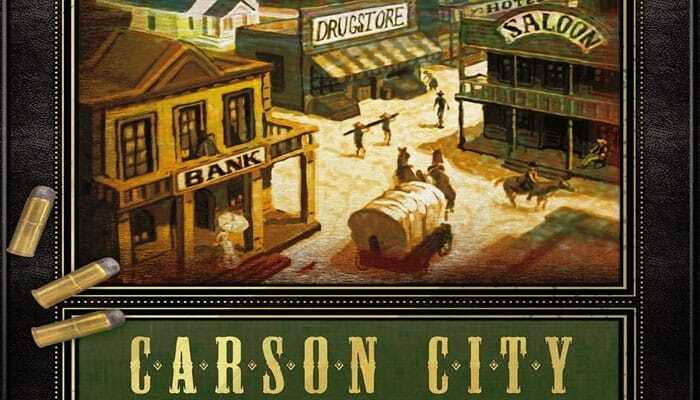 The winner will be the most prominent citizen in Carson City, as measured by victory points that can be won both during and after the game. At the end of the game all players' belongings (money, buildings, parcels, mountains, houses) will be converted into victory points as well. The image below shows an example of set up for three players. Every player gets $15, 1 road, 12 property tiles of his color and 3 cowboys of his color. Roads and cowboys constitute the personal reserve of the player. The remaining money is piled near the board and constitutes the Central Bank. Houses, victory points, roads and remaining cowboys are placed near the board in the general reserve. One ranch is placed on the « $3 » construction square and another on the « $10 » square. A mine is placed on the « $4 » construction square and another on the « $12 » square. Three other buildings are drawn randomly from the bag and set on the remaining « $5 », « $6 » and « $8 » construction squares. 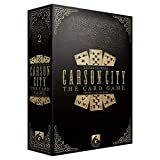 The center of Carson City is determined by rolling the dice (at the intersection of the column designated by the white die and the row designated by the black die). A house is set on that parcel and four roads are placed along the house, one per side. These roads will later be extended through the rest of the town. 9 mountains are placed randomly on the board (using the dice as above). If the designated parcel is already occupied, roll the dice again. The special (3) gun tile is set on its square. The turn counter is set on the start position. For the first turn, randomly choose the turn order. Starting with the first player and then in turn order, each player chooses a parcel by placing one of his property tiles on it. Next, starting from the last player and going back to the first player, each player chooses a second parcel. Any parcel may be chosen, including a parcel with a mountain or the center of Carson City. The picture above illustrates an example of setup for three players. All personality cards are placed near the board. Then, each player, according to turn order, chooses one of them. Certain choices may be directly followed by an action, depending on the personality. When all players have chosen a personality, the turn order is modified. The markers are placed on the upper turn order track in ascending order, according to the number indicated on the personality cards that have been chosen. After all players have chosen a personality card, the turn order is modified. In the example above, Green has chosen the sheriff, Orange the grocer, and Purple the mercenary. Choose an action: place a cowboy from your reserve onto one of the action squares above the city's map. Choose a parcel of land: place a cowboy from your reserve onto one of the parcels. Attack/Defend a Building: place a cowboy from your reserve onto a building to attack it (or to defend it if this building is yours). Pass: move your marker onto the first free position of the lower turn order track. Your turn is over. you are not allowed to place additional cowboys during this turn. None of the options are obligatory. But you have to choose one of them, unless you have passed. 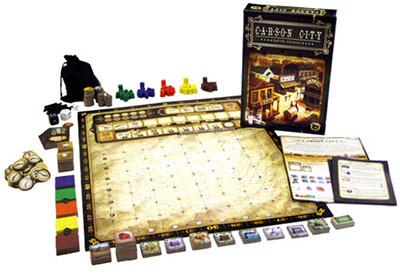 You are allowed to buy several parcels during the same turn (a cow-boy must be placed on each). You may place a cowboy on a square or a parcel already occupied by another player's cowboy. This will lead to a duel. on some squares, one player can place several cowboys. When a player chooses to pass, he moves his marker onto the first free position of the lower turn order track. In the example above, Orange is the first player to pass. After all players have passed, the actions are performed one by one according to the sequence on the board. As soon as an action is completed, the cowboy goes back to the general reserve. If several players have placed a cowboy on the same square or parcel, a duel occurs. Every player involved rolls a die. The number obtained is added to the number of revolvers and cowboys in the respective player's reserve. The winner is the player with the highest total. The winner has won the right to perform the action. The winner's cowboy goes into the general reserve. The loser will not perform the action he was fighting for. He places his cowboy back into his personal reserve. When more than two players are involved in a duel, all losers recover their respective cowboys. In case of a tie, the player (among the ones involved in the duel) with the lowest turn order number on the turn order track is the winner. The turn counter token is moved one square forward (left), blocking one of the "victory points purchase" squares from being used for the rest of the game. Every player receives new cowboys of his color. They are taken from the general reserve to be placed into the respective personal reserves. At the end of the 1st turn each player gets 4 cowboys, and each player gets 5 cowboys at the ends of the 2nd and 3rd turns. The maximum number of cowboys in your personal reserve is 10. Money beyond your cash limit (indicated in red on the personality card in your possession) must be spent. You get 1 victory point per $10 that you must spend. You are allowed to spend more money, but you always receive 1 victory point per $10. The buildings that have not been bought are shifted sequentially towards the squares with lower prices. For each remaining available position, one building is drawn randomly from the bag and placed on the Action track before the begin ning of the next turn. Any player may decide to not perform an action that he has chosen(for example, if he realizes that he will not have enough money for everything), even if he won a duel for the action. Nevertheless, his cowboy goes to the general reserve. No duel on this square. A player receives $4 for each of his cowboys on this square, which means that a player can place multiple cowboys on this square. The player who wins this action receives the special 3 guns chip for the rest of the turn. At the end of the turn this chip goes back to its place on the board. The player who wins this action receives 3 new roads to put in his personal reserve. The roads in the personal reserve are available for construction and may be placed on the board at any time during the game. No duel on this square. Each player receives one road for each of his cowboys on this square which means a player can place multiple cowboys here. Note: a newly constructed road must always must always extend previous placed roads. To buy an owner-free parcel, a player must have put a cowboy on it (and not on the parcel purchase square) during the cowboy setting phase. He may buy it now. If several players try to buy the same parcel, a duel determines the winner. This parcel may already contain a house or a mountain. The parcel price is $1, plus $1 for every building, mountain or house situated on this parcel or next to it (including diagonally). 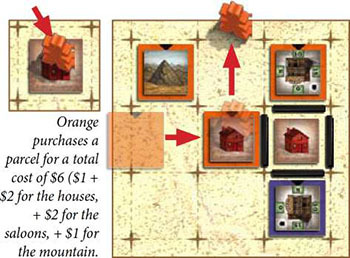 The amount is paid to the Central Bank and the player must place a property tile of his color (the cowboy goes to the general reserve). If there is more than one duel during a parcel purchase action, the player (among the ones involved in the duel) with the lowest number on the turn order track decides in which order the duels take place. The parcel must be reached by a road. At least one road must touch one corner of the parcel - see example on the right. If there is no road reaching the parcel yet, the player is allowed to place one or more roads on the board from his personal reserve. Exceptions: ranches and mines do not need to be reached by a road before being built. 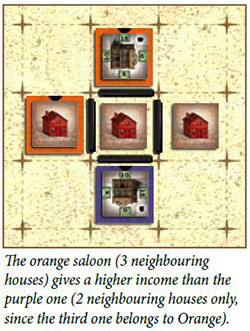 When building a drugstore, a mine, a bank, a saloon, a church or a prison, the player must also place a house for the new inhabitants attracted by this new activity. This house has no cost and must be placed on a free parcel (no building, no mountain) reached by a road. This parcel may already belong to the player. The house may also be built on a parcel already belonging to another player (upon agreement) or on an owner-free parcel. In this last case, the parcel may still be bought later. Note: Instead of building it immediately, a player may also keep the building he has just bought in front of him, and build it later (for example, because the parcel has no road connection yet, or because he cannot find a position for the required house). To place it on the board, he must wait until the end of the next "building construction" action. All players may have several buildings in front of them. The player who wins this action gets $2 per parcel he owns. The player who wins this action gets $2 for each firepower point. The firepower of a player is the number of cowboys and revolvers in his personal reserve. The player who wins this action must roll two dice and receives the rolled amount in cash. A3 and a 5 would result in $8. Each building brings money to its owner, depending on the buildings and houses in the vicinity. This action is automatic; there is no need to put a cowboy on a square to get this income. It is possible to put a cowboy on a building of another player to at- tack it. If the resulting duel/attack is successful, the attacker will steal half of the income of that particular building (rounded down) from its owner. One player may also place a cowboy on his own building in order to help defend against an attacker in a duel and protect his income. Note: When a house does not belong to a specific player (when it is built on an owner-free parcel), it can increase the values of all neighboring buildings, whoever the owner is. However, when built on a parcel belonging to a player, this house will only benefit the buildings of that player (see example on the right). The same applies to mountains and mines. The player who wins this action gets a number of victory points corresponding to half the amount of parcels he owns (rounded down). These parcels do not have to be adjacent. The player who wins this action gets an amount of victory points corresponding to half his fire-power (rounded down). The firepower of a player is the number of cowboy and revolvers in his personal reserve. The player who wins this action may buy victory points at the price of $2, $3, $4 or $5 per victory point. Each building, house and mountain gives 2 victory points to their respective owner. Any remaining money is also used to buy victory points (at $6 per victory point). Empty private parcels as well as buildings in the player's reserve do not reward victory points. The winner is the player with the highest number of victory points. In case of a tie, the player (among those involved in the tie) with the lower number on the turn order track wins.